Tone2 Rayblaster: it's going to look sort of like this. 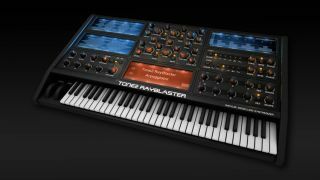 It may be no more than a 3D-rendered screenshot at the moment, but the reveal of Tone2's forthcoming Rayblaster synth is still getting people talking. UPDATE: Tone 2 has now posted full Rayblaster details and sounds on its website. Check out the feature overview list below. Like so many instruments before it, this Impulse Modelling Synthesizer promises a "completely new and unique approach to synthetic sound generation". We'll reserve judgement on whether or not that's true, but Tone2 certainly has form in this area - Saurus, Electrax and Gladiator are all synths that have met with our approval - so we're hoping for something special. Price and release date are TBC. UPDATE: We still don't know the price, but Tone2 has confirmed that Rayblaster will be released in early December. Lets your music stand out from the crowd! Filter import: Mimic filters of other synthesizers or create your own fantasy filters.